Macworld reader Daniel Johnson captured this star-burst effect by choosing a small aperture. The first of our reader-submitted snapshots features a very cool lighting effect that's easy to recreate. Aspiring photographer Daniel Johnson used his Nikon D90 and a tripod to take this nighttime shot at Volunteer Landing in Knoxville, TN. Daniel set up his tripod and camera by the river just after sunset, during the so-called “blue hour.” By not shooting too late into the night, he was able to capture a rich blue color in the sky. He mounted a Tamron 14-50mm f1:2.8 lens on his D90 and took this shot at a 30 second exposure with an ISO setting of 200. 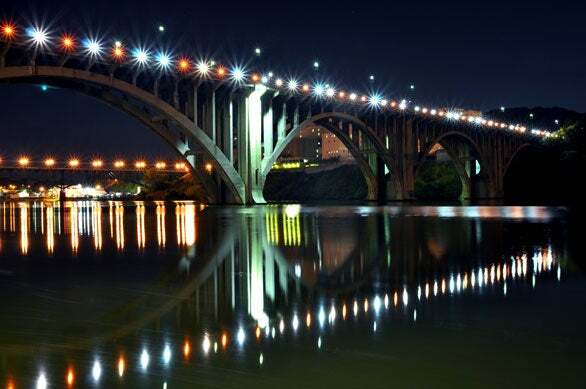 To create the sharp starburst effects on the bridge lights, he shrunk his aperture down to f/14 which diffracts the light. The smaller the aperture (at f/12 or smaller), the more pronounced the starburst effect (also called a sunburst) will be. The exact number of points that appear around a light will vary depending on the type of lens and how many blades it has. Johnson recommends sticking with a shorter focal length as zooming in can cancel out the effect. Want to submit your own photo to our Snapshot series? Send the photo (or a link to the photo) and a description of how you got the shot to digitalphoto@macworld.com. Include the text “Snapshot” in the subject line. We’ll pick our favorites and feature them on our Website. Chosen photographers will receive a free printed copy of our Digital Photography Superguide.